Samsung has officially launched a smartphone with a curved display, but it will only be sold in South Korea. The Galaxy Round will go on sale tomorrow, exclusively on the SK Telecom network. The device is the first smartphone to feature a curved screen. It has a 5.7in super AMOLED panel with a full HD, 1080p resolution. The curved screen doesn't appear to add any extra functionality over regular, flat displays, but Samsung has included some typically TouchWIZ features. A "Roll Effect" feature enables users to display the date, time, missed call and battery indicator when the home screen is off, by tilting the phone forward when it's on a flat surface. Samsung has also highlighted a "Bounce UX" feature that enables users to control their music. 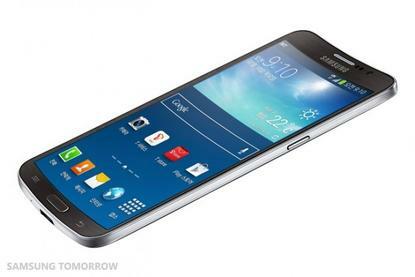 The Galaxy Round has similar specifications to Samsung's flagship Galaxy S4. It weighs 154g, is just 7.9mm thick, and runs Android 4.3 Jelly Bean. Other features include a 13-megapixel camera, a 2.3GHz quad-core processor, and a large 2800mAh battery. The Samsung Galaxy Round will be available to purchase in South Korea from tomorrow in a "Luxury Brown" colour variant. The device is unlikely to be sold in Australia and there's no word yet whether it will launch in any other international markets.